Dozens of people gathered at historic Koinonia Farm on Sunday to mark the 10th anniversary of Millard Fuller’s death, gathering at his rural gravesite to share remembrances of a man whose vision, faith and drive launched a worldwide movement and helped millions of people have simple, decent places to live — a movement that lives on through his final ministry, The Fuller Center for Housing. 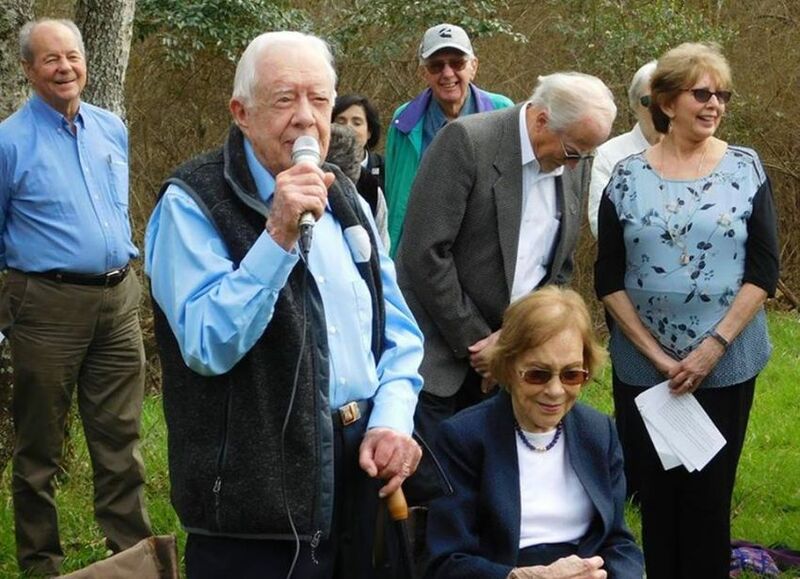 Former President and First Lady Jimmy and Rosalynn Carter were among those who spoke at the graveside (videos below). President Carter recalled how Fuller twisted his arm into joining his movement — and that he is forever grateful that he did. Many shared stories of how Millard Fuller was faith-driven and refused to take “no” for an answer. Some of these stories are shared in the videos below. I can hardly wait to watch all those! Thanks for making a download available, and I’ll also watch the individual messages. This was a special inspiration for me. Seeing and hearing a former student (Sharon Tarver Evans), watching a former president and his wife hold hands as they stood and listened, and hearing the inspirational tributes to Millard Fuller. I was humbled and honored to be invited to attend..